The decisive step takes place in the cavity of a spherical compound—known as a molecular capsule. The resorcinarene capsule used has been known about for around 20 years but its catalytic effect has only very recently been described, by Tiefenbacher and others. 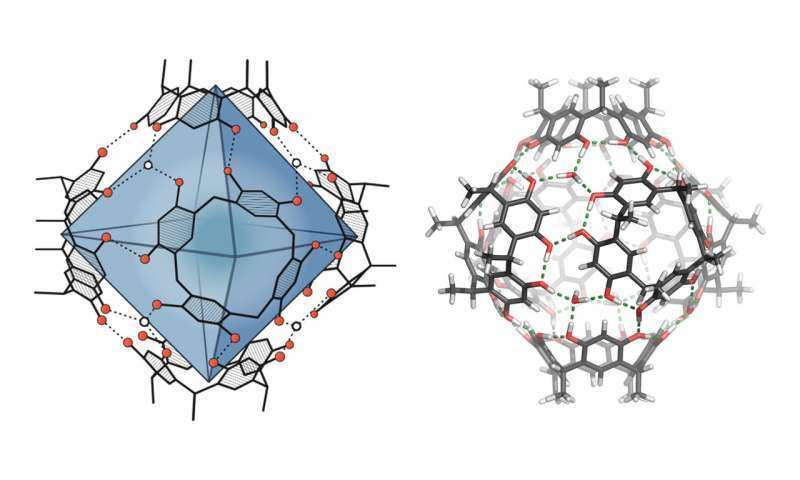 In organic solvents, the capsule forms itself from six smaller, ring-shaped compounds with the help of hydrogen bonds. The applicability of the concept was proven by the four-step synthesis of the natural product isolongifolene, with the formation of a ring-shaped terpene compound catalyzed by the capsule as the key step. This succeeded—when compared with conventional syntheses—in significantly fewer steps and with a good yield. Using labeled precursors and with the help of computer simulations, the Basel chemists were also able to clarify the reaction mechanism.